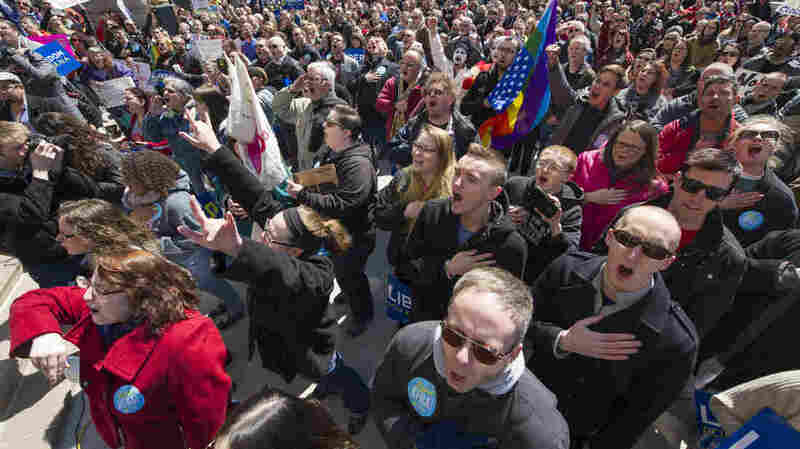 What The 2016 Hopefuls Are Saying About Indiana's 'Religious Freedom' Law : It's All Politics "This is simply allowing people of faith space to be able to express their beliefs," said Jeb Bush. Hillary Clinton tweeted: "Sad this new Indiana law can happen in America today." 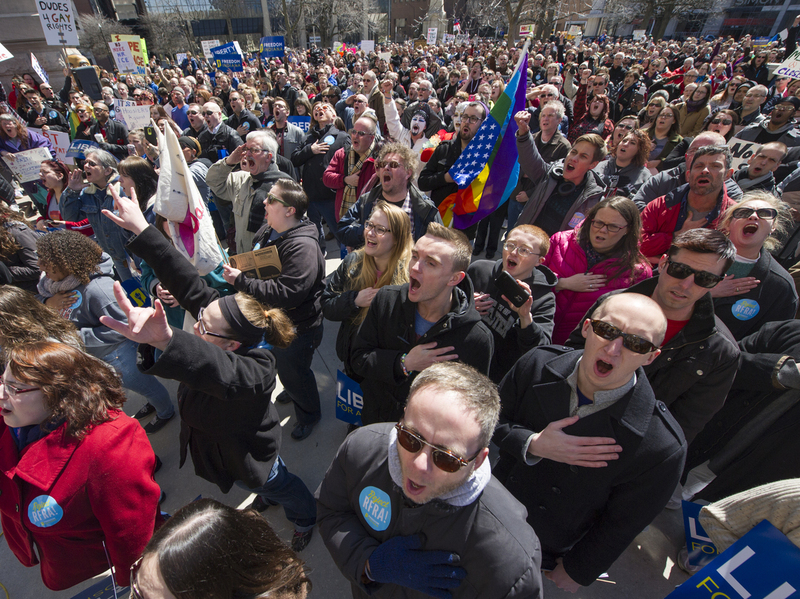 Opponents of Indiana's Religious Freedom Restoration Act gathered in front of the Indiana State House Saturday. Would-be candidates on the GOP side mostly defended the law. "I don't think Americans want to discriminate against anyone," Sen. Marco Rubio said on Fox News. "I think the fundamental question in some of these laws is should someone be discriminated against because of their religious views?" Wisconsin Gov. Scott Walker took a different approach, saying he doesn't intend to get involved with it or anticipate a similar bill coming to his desk. "In our state there's a balance between wanting to make sure that there's not discrimination [and] at the same time respecting religious freedoms. ... We do that in different ways than what they've done in Indiana," he said at a press conference. And on the lonely Democratic side, Hillary Clinton weighed in, tweeting her opposition to the law. "I think if you, if they actually got briefed on the law that they wouldn't be blasting this law. I think Gov. Pence has done the right thing. Florida has a law like this. Bill Clinton signed a law like this at the federal level. "This is simply allowing people of faith space to be able to express their beliefs, to have, to be able to be people of conscience. I just think once the facts are established, people aren't going to see this as discriminatory at all." "Sad this new Indiana law can happen in America today. We shouldn't discriminate against ppl bc of who they love #LGBT"
"I'm proud to stand with Gov. @mike_pence for religious liberty, and I urge Americans to do the same." "In our state there's a balance between wanting to make sure that there's not discrimination [and] at the same time respecting religious freedoms. ... We do that in different ways than what they've done in Indiana.